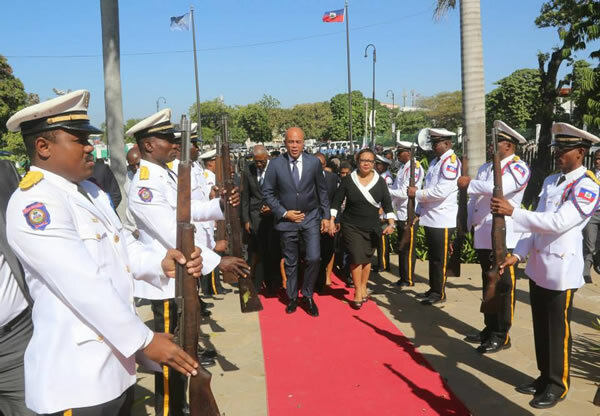 Here is a picture of haitian President Michel Martelly with Dr. Florence Duperval Guillaume who is the current acting Prime Minister on day of heroes, 2015. Haiti's fight for independence began with a slave revolt lasting ten years. The event that set off the revolution was a Voodoo ceremony, presided over by a Hougan priest named Boukman. Boukman, once a slave of British occupiers, was sold to a French plantation owner. Because of Boukman's intimidating appearance and terrifying temper, he was put in charge of the plantation slaves. But Boukman turned the tables by performing a Voodoo ceremony to empower the slaves to revolt against the French. On August 14, 1791, with the help of a Voodoo priestess, Boukman called upon God's help. The words he used have become part of Haiti's cultural lore. Boukman first acknowledged God's great creation. He next acknowledged God's awareness of the war crimes perpetrated against the slaves. He finally invoked God's almighty power: "He will direct our arms, and stands beside us. Destroy the image of the white men's god . . ." Boukman ended with a rallying cry: "Listen to the voice of freedom rising in our heart." Once the French caught Boukman and executed him, the killing provoked the slave revolt.